WordPress stores content such as posts, blogs, comments, pages, usernames, etc and requires a database (DB) to store and maintain all this information. A database is a storehouse that enables you to organize and maintain your information. WordPress runs at its best on a MySQL database. All web hosts have a built-in MySQL server and database support. 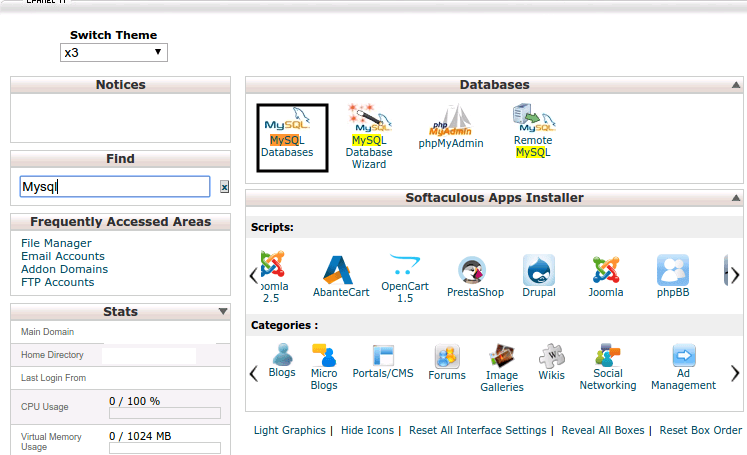 The following sections will help you understand how to set up a MySQL database on a web host using cPanel. The first step in setting up MySQL is creating a database. 2. Enter a new database name (e.g. blogva5_test1). The database name comes with a prefix which is your cPanel username. Once you have created the database, you will need to create a user. A database user is required to add, retrieve, or alter any content within the database. Enter username (only alphanumeric characters are allowed). Enter a strong password. A strength indicator is provided that will help you discern the strength of your password. You could also use the Password Generator that will provide you with potential passwords with a single click. Remember to save this password for later use. Once you have created a database user, you have to associate it with the corresponding database. Select the database from the drop-down list. Check All Privileges so that the database user can access and modify the entire WordPress content.